The O5K is a unique luminaire alternative with a fully perforated body and a screen that incorporates two different density hole sizes, a detail unique to the lighting industry. Fixture strength allows for sections as long as 12′ with only two (2) hanger assemblies. As a result, straight alignment for continuous row installations can be maintained with a minimal amount of supports. 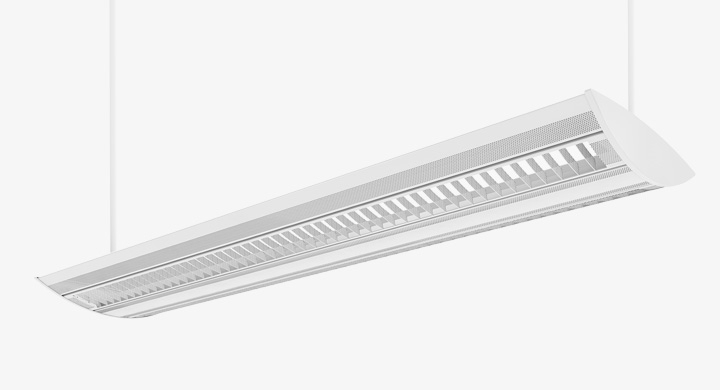 The aesthetics are only part of the reason for this low profile, fully perforated fixture. The soft illuminance which emanates from the perforated screen, the selection of the hole sizes and the shape of the fixture are all designed to “glow” with a similar illumination level as the indirectly illuminated ceiling 18″-24″ above it. As a result of this design, the brightness of the fixture and ceiling become harmonious with each other; an ideal design approach for reducing glare on computer terminals. Copyright © 2019 Metalumen Manufacturing Inc. All rights reserved.